Leveraging disparate time zones to turn an innovation sprint into a round-the-clock hot house of rapid prototyping and iteration on steroids. On a digital innovation sprint focused on higher education in partnership with Cisco Systems, the team at Propellerfish was up against a common problem: we needed to accomplish a lot in a short time with a group of people whose calendars made coming together challenging. We had done our homework. We had spent time with our users. We had toyed with early solutions in the field, but there was a lot of work to do in turning early concepts into tangible solutions. Getting to material solutions involved weaving in the expertise of a diverse group of partners. We needed a couple of working sessions with some prototyping and refinement in between, but people’s schedules suggested this was not going to happen. We were able to bring everyone together for four short days to get as close to a tangible solution as possible in a short time. We split our team across time zones with our main working team in Berlin supported by technologists and designers at Propellerfish’s Singapore office. This turned four days into eight with work happening around the clock. Roles were clear by location. 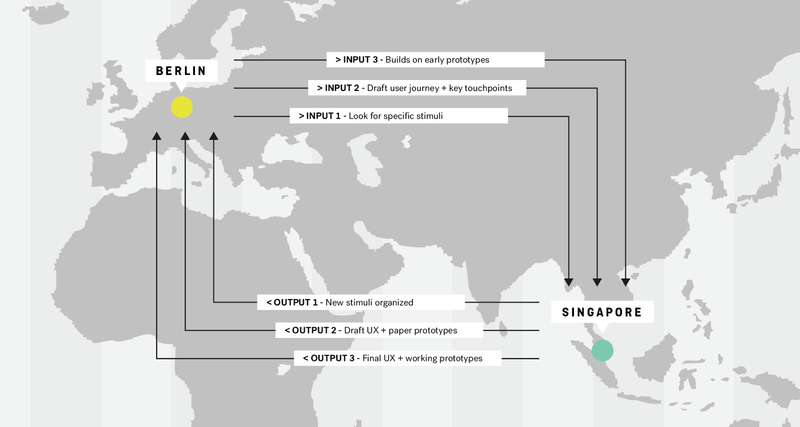 The engine of our conceptual thinking was a cross-partner team in Berlin while our prototyping and refinement was done by a team posted to our Singapore office. The result was magic. After a day of developing solutions on paper in Germany, we would brief the team in Asia who then spent the next day making our solutions real. Apps would show up on our phones and interfaces would appear online each morning when we woke up. Our solution started to become real at an otherwise impossible pace. We were able to get tangible quickly, have the right conversations about solutions we could hold in our hands, and make agile changes in real time to move our project along faster. We’ve now made this a regular practice on projects and have learned five keys to making this work. 1. Make roles clear by location: Ensuring that the roles of concepting, making and refinement have clear owners means fewer miscommunications across time zones and the focus you need to move at pace. We recommend the core thinking happen in one location while making happens in another with a seasoned person on the making side to oversee refinement that needs to happen while going from concept to prototype. 2. Maximize distance between time zones. This means you maximize the working hours between handoffs and increase the likelihood that you can overlap at the beginning and end of each day. 4. Get your technology sorted early. If you’re building apps, use technology that makes sharing those easy and make sure everyone knows how to use it. If you’re looking at simpler 2D designs, leverage cloud file sharing systems that everyone can use. Have a printer in your workshop space. 5. Show what’s happening on both sides. Glimpses into how each side team works between handoffs creates an air of momentum and excitement; it also helps remote teams empathise with each other’s constraints and needs. Try setting up a web cam that let’s participants get real time glimpses of what other teams are doing. If you want to learn more about how Propellerfish runs round the clock work sessions across time zones, feel free to drop one of us a line and we’d be happy to share tips and experiences.